A postcard depicting pictures of a passion flower and bird-of-paradise, two tropical flowers found in Florida. These two particular flowers were photographed at Sarasota Jungle Gardens, located at 3701 Bay Shore Road in Sarasota, Florida. In 1936, the attraction opened upon what was a banana grove the decade before, until David Breed Lindsay began developing a botanical garden. Sarasota Jungle Gardens was sold to the Allyn family in the late 1940s and is still in operation today. Original 3 x 5 inch color photographic postcard: ACC# SM-00-243, file folder 1 (U.S. blanks), box 10A, Lucile (Mary Lucile) Campbell Collection, UCF Public History Center, Sanford, Florida. Digital reproduction of original 3 x 5 inch color photographic postcard. "About Sarasota Jungle Gardens." Sarasota Jungle Gardens. http://www.sarasotajunglegardens.com/About-Us. 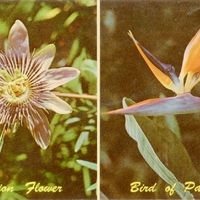 “Passion Flower and Bird of Paradise Postcard.” RICHES of Central Florida accessed April 26, 2019, https://richesmi.cah.ucf.edu/omeka/items/show/6792.